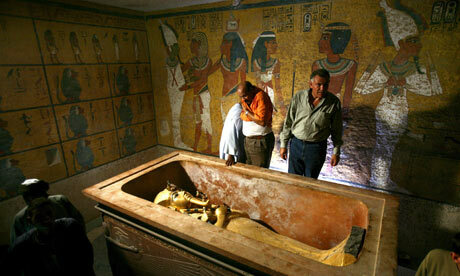 This famous tomb is amongst the smallest in the Valley of the Kings. Nevertheless it contained treasures w'hich may have represented the most abundant hoard ever buried in the valley. For, contrary to initial belief that the treasure belonged to a boy-king who had a short and not very significant reign, it is now known that some of the objects date back not only to the Amarna period, but even to the reign of Thutmose III. The five thousand-odd objects catalogued from the tomb, therefore, represent a uniquely accumulated collection and, perhaps, the richest placed in any tomb. The first chamber (A), which measures a mere 8x4 metres, is undecorated. Bare, too, are the walls of the small Annex (B). The only chamber with decorated walls is the burial chamber itself (C). The burial chamber was originally sealed off by a plastered wall, before which stood two life-sized statues of Tutankhamon in dark varnished w ood, with gold ornaments, headdress and kilt. When the wall was broken through, the outermost shrine of wood, covered with gold-leaf, was revealed. Within it were three similar, smaller shrines, one inside the other. The sarcophagus of crystalline sandstone lay at the centre. 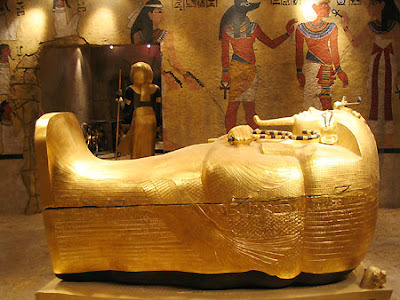 Inside the sarcophagus were two wooden coffins in portrait images of the king, overlaid with thin sheet gold, and a third, inner coffin, in which the mummy lay, which was of pure gold inlaid with semi-precious stones and coloured glazes. The walls of the burial chamber retain the vividity of colour as on the day they were painted. On the right-hand wall the mummy of the deceased is shown being brought to the tomb by noblemen, one of whom is General Haremhab who later became pharaoh. 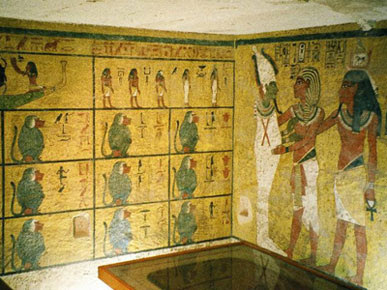 On the rear wall, Tutankhamon is depicted with the figures of the goddesses of heaven and with Osiris. There is also a unique representation of the ‘Opening of the Mouth’ ceremony being performed on the deceased king by Aye, who briefly succeeded him to the throne. This ritual was a most ancient one, performed to give the deceased life and power to eat and breathe. On the left-hand wall (a) are symbolic scenes showing the adoration of apes representing the twelve hours of night. The sarcophagus remains in the burial chamber with the outer of the two wooden coffins containing the decayed mummy of Tutankhamon.